How do we parse and read a CSV file? Now we have our component set up to accept a CSV file, and we can overwrite the submit action to grab the file and read it. Now we can do something with our file. This is when the FileReader API comes in handy. FileReader allows us to read a file safely and catch any errors we may run into. Specifically, we want to use the onload function and readAsText function to read the content of this CSV. 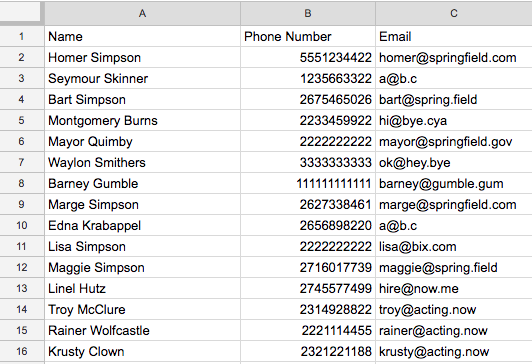 Note: our example is a simple CSV file, which is just plain text. But there’s a lot more to FileReader such as readAsBinaryString or readAsArrayBuffer that you can research on the File API documentation site. The first row (the column headers) are the attributes on our model. Our first step is separate those out, as all the other rows are our actual data. The first thing we have to do, however, is turn this long string of text into an array. Our CSV will be one long string, separated by line breaks. We can add textFile.split('\n'); to create an array. This will give us an array where each item is a row from our file. This way, we can just grab the first index of the array to get our attributes/column headers with array.shift(). Now it’s just a matter of lining up everything. Since we know our indices will match, we can just iterate over our remaining items and find the corresponding column header (or fieldName). When we used shift() we actually mutated the original array. So our variable content only has the list of characters left. Since the CSV file is always in the same order, we know that the first value for a row matches the first item in our fieldName array. // for every row remaining, let's create a "character"
Well, that was a journey. Once we had it working, however, we ran into a not-so-obvious problem: testing. Testing that the form submits is rather straightforward, and I’m not going to go over testing that the records are created (as our example is rather trivial). The real issue was figuring out how to test uploading and submitting a file. My first instinct was to just stub the value of the input. After all, that’s easy to do for every other type of input. Turns out that’s not possible. I was a bit miffed at first, but it makes sense. After all, if it was easy to change the value of a file input, then you could easily write a script to steal people’s files.